You know firsthand that your government workers are not underworked, overpaid, or mindless clones just carrying out the morally compromised work that politicians forced through the pipeline. You are quite aware that these and other common stereotypes of public sector employees don’t apply to your team . . . but are they?Besides having to daily overcome the persona of being a government employee, your hard-working employees face enormous pressures and challenges every day and are asked to solve some of our country’s toughest problems, including unemployment, security, poverty, and education. To be able to return to their desks each and every day with the passion and commitment required to accomplish these overwhelming duties will require a manager who knows how to leverage talent, improve performance, and inspire passion within these true servants.In Engaging Government Employees, Bob Lavigna--with over three decades of experience in public sector HR-- gives managers the tools they need to leverage the talents of government's most important resource: its people. Readers will learn:• Why a highly engaged staff is 20 percent more productive • How to get employees to deliver “discretionary effort” • How to assess the level of engagement • Why free pizza and Coke every Friday is not a viable strategy • And moreEngaging Government Employees rejects the typical one-size-fits-all approach to motivation. 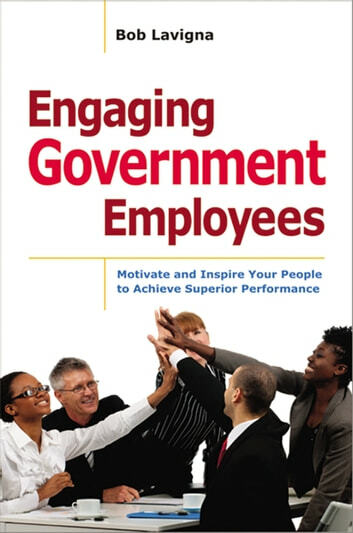 Drawing on a wealth of empirical evidence, this indispensable resource shows how America’s largest employer can apply the science of engagement to get team members passionate about the agency’s mission and committed to its success.